Luke Alvarez, a science teacher at a Cherry Hill (N.J.) middle school, created a surfboard for paralyzed people to use at an August event in Wildwood. Seventh graders from the school created the artwork that adorns it. By trade, Luke Alvarez is a science teacher at Carusi Middle School in Cherry Hill. By soul, he is a surfer who has sculpted custom boards for more than four decades. In recent weeks, the 61-year-old who lives near the water in Ocean County, has been involved in a project unlike anything he’s taken on before. It will culminate next Friday, when the fruits of his labor – and his students – will be presented to a worthy cause. Four years ago, Alvarez’s teaching/surfing duality captured widespread attention after an article in a local newspaper. He’s since been deemed the surfboard guy by everyone from principals, school-district officials, parents and students. He’s parlayed those skills into a chance to help MossRehab get people with disabilities onto the waves at Life Rolls On’s annual “They Will Surf Again” event in Wildwood. While he’s donated to the cause for three years now, a longboard created for the August 5 event has special meaning. 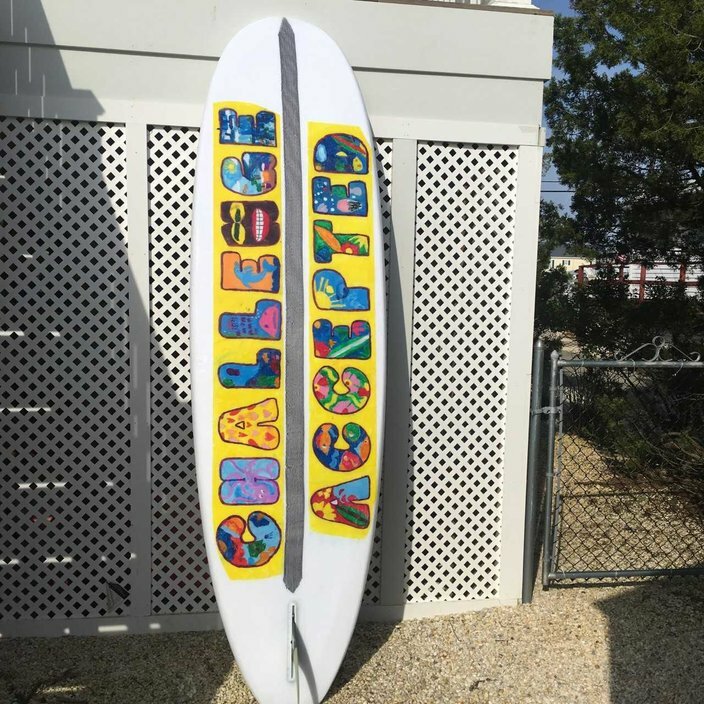 The nine-foot board features artwork (a “Challenge Accepted” motto with colorful beach- and surf-inspired designs) created, and applied, by seventh graders with disabilities. Hearkening back to the beginning of the relationship with Moss, Alvarez said the rehabilitation facility reached out to ask whether he’d be willing to donate a board. He said yes before realizing they didn’t need the standard five- or six-foot version, but a longboard with specifications so that a trained surfer could take a paralyzed or otherwise disabled co-surfer out with them for a tandem ride. The customized tandem board is 9-feet 6 inches long with a camera attached to its nose so the surfers will be able to relive the once-in-a-lifetime experience. “The looks on their faces is indescribable,” said Alvarez, who’s been in the game so long that his company – Generic Brand Surfboards – is creating surfboards for the grandchildren of people he learned to surf with. What Alvarez likes most about the artistic design – watercolors and rice paper – is that it’s “really organic looking” in a not-exactly-paint-between-the-lines approach as opposed to Madison Avenue polish. “When people look at it, they’ll know that kids did it, what they put into it,” he said of the 11- to 13-year-old middle schoolers, some of whom are in wheelchairs and others with Down syndrome and cerebral palsy. 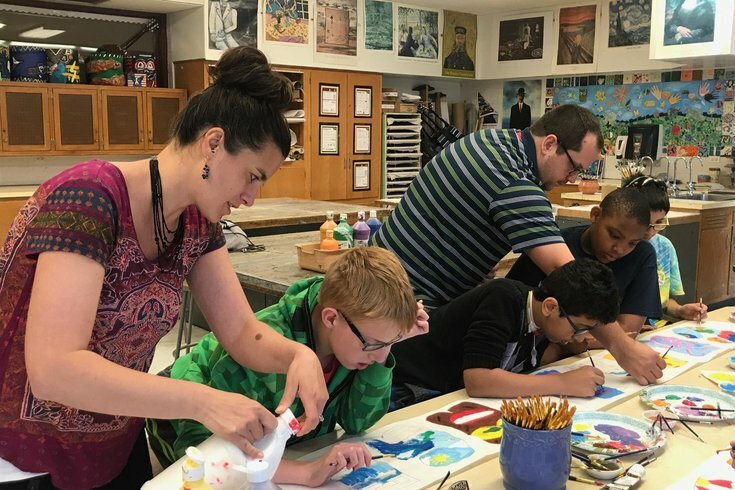 “It just makes me feel so good, being able to get the kids involved in something that they otherwise wouldn’t have been able to get involved with. The longboard will be officially presented to MossRehab officials at the Cherry Hill school during a 2 p.m. event next Friday. The school’s principal said he’s a big fan – of the project and Alvarez. They Will Surf Again will be held from 8 a.m. to 3 p.m. on August 5 at Baker Avenue beach in Wildwood. Registration to volunteer or participate begins June 20.